What is a good moveset for Glalie? Avalanche: STAB, Glalie has only average speed, so plenty of foes will go first. Crunch: Good power, type coverage. Earthquake: Type coverage, used to deal with Fire, Stee, and Roc types. Toxic: Helps KO foes, inflicting toxic poison. So the objective of this set is to be an unexpected sweeper. You use protect on the first turn, to see what stat boost you get with Moody. If you get an attack boost, you mega evolve and use explosion to pretty much OHKO what ever unlucky Pokemon stands in your way. As there is less than a 30% Chance (2/7=~28%) that either Attack state could be boosted at any given turn, this set is extremely unreliable and gimmicky at best. Also, get your facts straight, since both of its main attacks are suicidal, it's obviously not a sweeper. Shadow Ball is just random and pointless. The fact that Sheer Cold is more reliable just tells you why you shouldn't run this. 252Attack, 6 Sp. Attack/Defense, 252 Speed. Mega Glalie is honestly not that great by Mega Evolution standards and I'd rather use Moody, but we digress; it still has some tricks up its sleeves to make it interesting to run. Refrigerate Return is one of them, having a great 132 Base Power without drawbacks. Combined with 339 Attack it hits decently hard. Earthquake in the next slot; it's a good coverage move thanks to its high base power and ability to hit the fire and steel types that resist Return Super Effectively. Freeze Dry nails Water-Types, which are also often EVed to be Physically Defensive. And now, well, well, we get to Explosion, which is awesome sauce; Explosion has a whopping 325 Base Power before STAB, and with STAB, almost has as much effective Base Power as it did in Gen IV. If you know Glalie is going to faint after taking another hit then just Explode, and watch things die. Let's be honest here, with 80/80/80 Defenses Glalie will only really be taking one hit at most before dying, and is very much capable of being OHKOed by a powerful unboosted Attack, so its not that big of a deal in the long run. Ice Shard and Spikes are interesting options Glalie has that you may also want to consider using, but please don't use Crunch or Iron head--They just don't do enough. 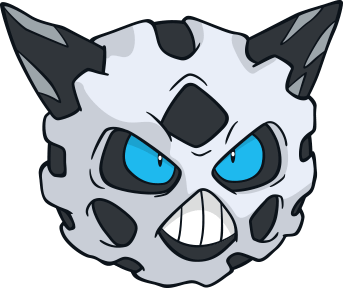 Ice shard can revenge kill weakened threats, and Spikes can weaken them by up to a quarter of their health every time they switch in; Flying types don't readily enjoy Glalie. Thats a great moveset except maybe Ice Beam instead of Avalanche but thats good, too. P. S. Charizard Maxed out lvl 55. I gave him a test at lvl 50. I had him go up against Will of the Elite 4's Bronzong. 1 earthquake and he was under half health, he used reflect, I finished him with Flamethrower! Substitute gives nice protection, and works well with Disable. Disable well, it disables the opponent lats moves which can be helpful especially since it's unexpetced on Glalie. Ice Beam is solid STAB and hits pretty good damage. Shadow Ball gives some neutral coverage there. Protect because speed doesn't come into effect on the first urn of Mega-evolving. Ice Shard for quick take downs. Crunch is a filler move. Too bad it doesn't get a Psychic-type move to cover its Fighting-type weakness. That can be a big downfall. Luck, You need it for this Set. You substitute until low on Health, Activating your Starf berry that Randomly Sharply Raises one of your Stats, Like moody without the Loss. Getting moody boosts the Whole way through, and Then sweep. Explosion for Last resort. Moody is banned in most unofficial metagames inckuding the Smogon metagame. But the fact of it being a luck and evasion-based ability aside, I think people forget that it isn't a bad ability. In fact, Moody is about as broken as it is luck-based. Sub/Protect lets you stall for as much time as you need to get your Moody Boosts. You should always aim to bring in Glalie in against a slower Pokemon if you can, such as with walls; Glalie wants to set up a Substitute before the opponent can hit it with a supereffective more or burn/poison it (which will stop its lefties recovery and prevent it from making Subs over the long haul.) It doesn't usually matter what Glalie is up against after that since they can't touch it directly. Frost Breath is useful over Ice Beam here since critical hits ignore stat drops, which may happen because of Moody. Overall, it keeps you from loosing offensive power, takes advantage of your accuracy boosts to an extent, and ignores your opponent's calm minds. Earthquake is a physical attack that lets Glalie use incoming attack boosts (otherwise that +6 attack is just for show). It also has good coverage with Ice attacks. Max HP helps you to take advantage of Def/Sp.Def boosts; This set wants to stall for time with Substitute, so why rely on evasion to keep them up some of the time when you could use your Def/Sp. Def to do so all of the time? We use a -def nature though, because with Rock, Steel, and Fighting moves usually being physical attacks, it'll most often be a lost cause. If you don't think Moody is broken, look at this moveset and see how much luck is required for this set to work. Couldn't it run a non-Mega rain set? Use Substitute and set up with Rain Dance, then proceed to attack the foe with mainly Water Pulse due to its increased power in the rain and the fact it's SE against Fire foes- however if you want to be protected partially from Fire attacks used for coverage on other typed Pokemon's sets then you don't need to use Water Pulse all the time. Ice Shard is useful for its STAB, priority and another boost with the Never-Melt Ice. You can also use Frost Breath for its constant crits and that if you have negative Sp.Atk boosts then its power isn't weakened, or Freeze-Dry to cover opposing Water-types that use your rain to their advantage. You can even use this against Rain teams and take their rain to your advantage, as well! But I'm not sure if this is the best set for a non-Mega Glalie due to its mostly middling stats, but when the dice rolls in your favour when it comes to Moody boosts, you can have a bit of fun with it! This thing can take on a crit stone edge, fire blast and even a z brick break! What are the benefits and drawbacks of using Ice Shard instead of Freeze-Dry on Mega Glalie? Where is the Mega Stone for Glalie? Glalie or Froslass For a Hail Team?